...in the four Pushkin settings (in translation) that comprise Winter Passions the vocal line springs to life - partly a tribute to the singing of baritone Stephan Loges, but only partly - and even the instrumental writing seems quickened by it. This is a wonderfully rich cycle, which seems to contain far more than its ten-minute span should allow. 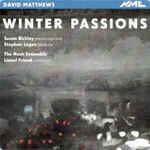 Just as impressive is the Second String Trio - not a medium that comes naturally to many composers, but Matthews makes a vehicle for music as energetic, impassioned and strongly sustained as in any of the symphonies. It’s hard to imagine this music played, sung, or recorded better.